The view across Bryant Park last Friday. 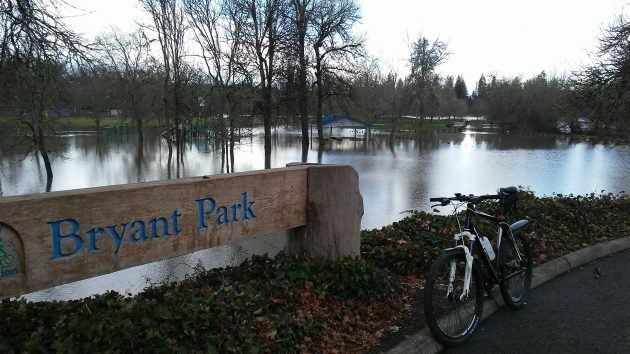 There’s no news here, just an observation: Wouldn’t it be nice if the seasonal wintertime flooding of Albany’s Bryant Park was a permanent thing and people could enjoy something called Bryant Lake all year long? Hasso, Over here in Lebanon we have a 100 acre lake right on the edge of town called Cheadle Lake Park. Fishers, boaters (non-motorized only), birdwatchers, hikers and many others use it extensively. It sits adjacent to Cheadle Lake Park, home of the Strawberry Festival, The Star Spangled Celebration, and many other events. It belongs to the City of Lebanon, via the Lebanon Community Foundation and donated by Freres Lumber Co. Albany residents are welcome to come and enjoy it with us. Access is from River Drive onto a paved parking lot. Another bridge might be nice too. Maybe a quicker ride to Another bridge might be nice. Maybe a quicker ride to to and from I – 5….North Albany to Millersburg. Waverly Lake is called a lake. Should we consider renaming it Waverly Pond? There are the ‘Freeway Lakes’, just down the road. I don’t go there myself, but it seems that folks fish there. An old quarry I believe? However, I like your ambitious thinking. It would be good to develop more lakes — good for wetlands, good for wildlife, good for people. Capture some of the high water in the winter to use all year round. As I said, we have various duck ponds and other former gravel pits, including Freeway Lakes, or log ponds like Cheadle Lake in Lebanon. But just because we call them lakes does not make them lakes worthy of the term. Its an interesting concept that what something once was makes it that forever, regardless of changes; natural or man-made. Of course Foster Lake was once just a stretch of the river and Cheadle Lake was a swamp before its usage as a log pond, and now converted to a recreational resource. Should we change the name back to Cheadle Swamp; or Cheadle Pond? To me, 100 acres of open water is a lake, not a pond. If Waverly Lake is a lake then surely something 10 times (or more) larger is too.